Peanuts and peanut butter seem to be having a renaissance. When I go down to Melbourne ,which is the centre of hipster food in Australia, peanuts seem to have squeezed their way back onto menu of all the best cafes. I even saw peanut and jelly pancakes on the breakfast menu at Lolo & Wren in West Brunswick. I didn’t order them (I’m more a of savoury breakfast person) but the woman at the table next to me did, they looked sensational and I was struck with severe order envy. I’ve always loved peanut butter and I’m glad it’s made a comeback. After years of not buying it, because of allergies and health concerns, it’s become a pantry staple in our house again.There’s good brands of peanut butter available at the supermarket now. I was buying Mayvers’ peanut spread with coconut, but their dark roasted peanut butter is absolutely delicious, and has no added oil or sugar. I first discovered it when it was half price at my local supermarket and a woman, frantically loading jars into her trolley for her peanut butter addicted family, sold me on the awesomeness of it. There’s nothing hipster about these old fashioned cookies. 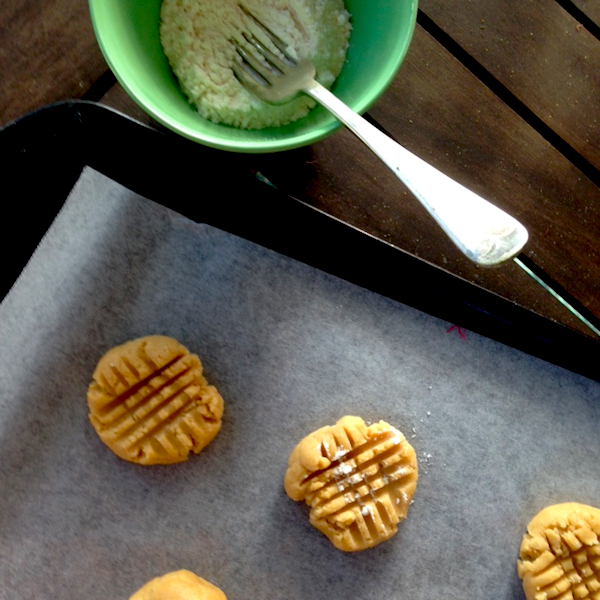 These are the kind of peanut butter cookies I would have eaten as a child. I love their wobbly imperfection with their simple forked cross hatch on top. I imagine this cookie became part of the Australian food vernacular during World War II when American troops were stationed in Australia and American food and music became all the rage. There were jazz clubs in Surry Hills and cashed up American servicemen created a booming cafe and restaurant culture. 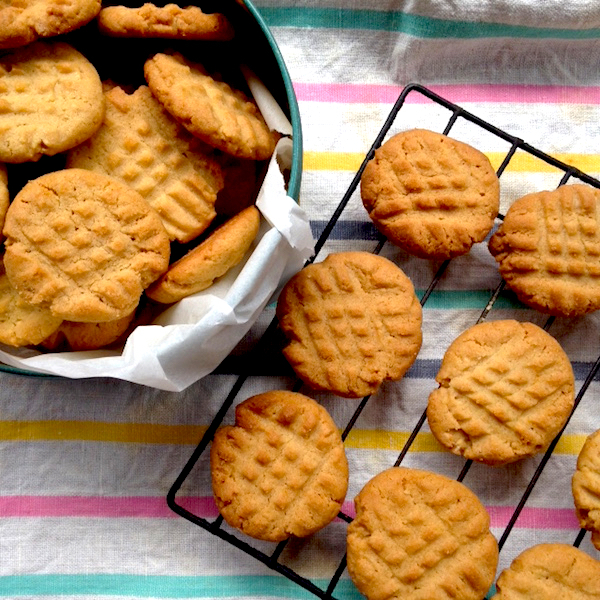 These peanut butter cookies may have even been the hipster food of the day on the cutting edge of the Australian culinary journey. 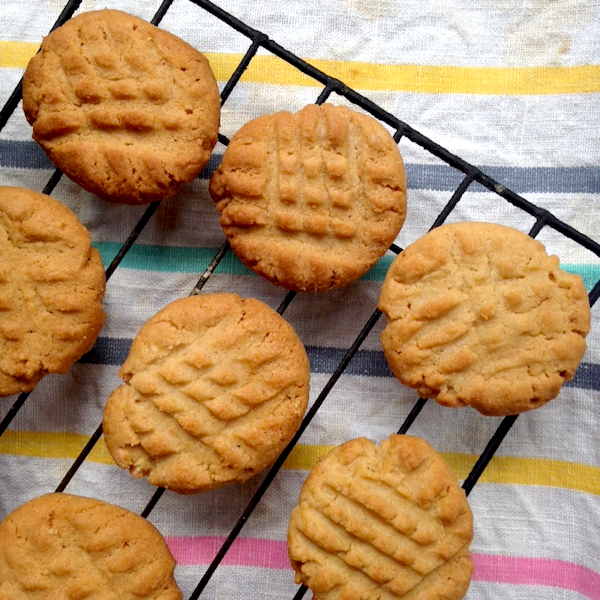 If you want to up the ante there’s a great turbo-charged peanut butter cookie recipe at Food 52, but I’m sticking with this childhood classic from the great Australian food writer and ethnographer, Margaret Fulton. Cream butter, peanut butter and sugars until lightened, then beat in vanilla and egg. Whisk together flour, salt, baking powder and bicarb soda and mix into butter mixture until it forms a soft dough. Roll dough into small walnut sized pieces and place 3cm apart on trays lined with baking paper. Flatten with criss-cross patterns with a fork dipped in flour. Preheat oven to 190C (170C fan forced) or 375F and bake for 10-12 minutes until risen and golden brown. Allow to cool on the tray before transferring to wire rack to cool completely. Don’t like peanut butter or have someone with allergies in your family replace the peanut butter with tahini, the vanilla with orange zest and sprinkle some sesame seeds on top before baking. My mouth is watering right now – few things better than a classic PB cookie and the criss cross pattern makes it taste better too ! I think the cross-hatching is cute too! These remind me of a recipe my grandmother would sometimes make for smoko. My grandmother used to make them to.